Larry Kudlow is a Nice Guy, But He’s the Wrong Choice for the White House. Pretty much everyone likes Larry Kudlow. He’s smart, telegenic and highly seasoned. He worked in the White House in the early 1980s and was part of the “Reagan Revolution” that cut taxes, cut regulation and stimulated growth. He was also a Wall Street economist, and most recently a television and radio commentator with his own show on CNBC for many years and a successful radio broadcast. Now, he’s back in the White House. 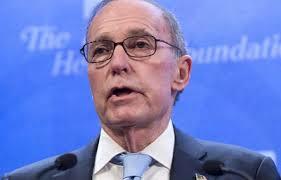 President Trump has selected Kudlow to lead the National Economic Council (NEC) which is President’s top advisor on domestic economic policy including taxes, budgets, entitlements and anything else touching the domestic economy. The NEC was created by Bill Clinton in 1993 as a counterpart to the National Security Council (NSC). The NSC would handle foreign affairs and national security and the NEC would handle domestic policy. The NSC and NEC are not remote cabinet departments. They are part of the White House operation and the directors of the NSC and NEC have offices in the West Wing and direct access to the President. As soon as I heard that, I called my gold dealer and bought some gold. Kudlow is a great contrary indicator. Next, Kudlow said with regard to Fed interest rate policy, “Just let it rip, for heaven’s sake. … The Fed’s going to do what it has to do, but I hope they don’t overdo it.” This was a clear direction to the Fed to slow down from their current pace of interest rate hikes. Here’s the problem. Kudlow’s two remarks, reported in the articles here and here, contradict each other. Slower rate hikes make for a weaker dollar and higher gold prices, but Kudlow says buy dollars and sell gold. Makes no sense. What’s worse is the White House should never pick a fight with the Fed because the Fed prides itself on its independence. The Fed might raise rates one more time than needed just to show Kudlow and the White House who’s boss. Kudlow’s a cheerleader for Trump’s economic policies and an effective communicator. That’s why Trump picked him. But, he is not a serious analyst and has already made contradictory remarks and picked a no-win fight with the Fed. My estimate is that once the trade wars flare up and the economy slows down later this year, Kudlow may head for the White House exits if he’s not pushed out first. Trump needs serious advisors, not cheerleaders.